I am pleased to add four new designs to the Christmas cards for 2009. These are based on the ghost stories written by Charles Dickens. 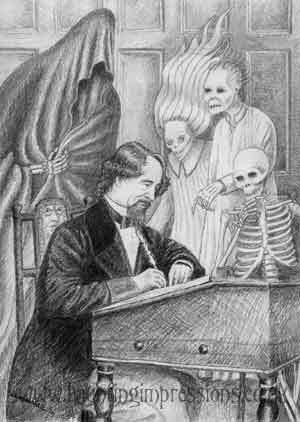 Although I had read A Christmas Carol many years ago and had watched The Signalman on the BBC at Christmas I didn’t really know much about the other ghost stories of Charles Dickens other than he published several at Christmas in his own literary magazines - these were always most popular when they included a ghost story. Apparently he loved a ghost story and owed this fascination for the supernatural to his nurse Mary Weller who terrified him with many tales. I was struck when reading a collection of his supernatural stories how many were in fact concerned with premonition and portent (To Be Read at Dusk, The Signalman), sometimes including ‘crisis ghosts’ - the appearance of those recently or about to die (Christmas Ghosts). The ghosts were sometimes concerned with vengence or seeing that justice is done (The Trial for Murder). His work included a range of styles, some reminded me of traditional folk ghost tales with elements of melodrama (Captain Murder and the Devil’s Bargain), gruesome. Dickens was one of a number of indiviuals who we have to thank for giving us the sort of traditions we now always associate with Christmas. Apparently in industrial Britain Christmas was under threat and many traditions such as carol singing were dying out. A number of Victorians made efforts to revive and promote Christmas as a holiday. Dickens is also credited with giving us the idea that Christmas should include snow - it is normally rare but he grew up during a minor climatic event that gave regular snowy Decembers. (Mind you, I have also heard this put down to the old Julian calendar slipping so that Christmas was actually ‘in January’ by the mid 17th Century.) He is also credited with inventing the Christmas Ghost Story - but I’m not convinced that he created it, rather he revived an older tradition. Producing the designs was not always that easy, A Christmas Carol has been illustrated several times and created on screen in film and television and was familiar enough, but Dickens doesn’t often describe his spectres in any great detail or the scene at the moment of terror, as M.R. James. When we do get a real ghost, it is quite a traditional figure often comfortable to chat with the main character. Although Dickens does draw the occasional spine tingling moment, more often the real terror is with the stories relating to portent. I produced 2 images from A Christmas Carol - of some of the more frightening scenes. The very first ghostly occurence is when Scrooge arrives home and his door knocker … well, it is a creepy moment. The Spirit of Christmas Yet to Come is the most sinister figure in his Reaper type appearance - which is justified when he reveals the inevitable future to Scrooge in the grave yard. The other image is taken from The Signalman which is one of the best ghost stories. I collected a few of the apparitions together with the author - including the ghost from the ‘Queer Chair’ for the last picture.